Directed by Rob Epstein, Jeffrey Friedman. Starring James Franco, Mary-Louise Parker, Jon Hamm, Jeff Daniels, Treat Williams, David Strathairn, Bob Balaban. I went into “Howl” really wanting to like it. 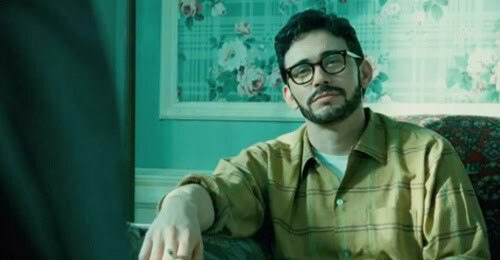 Maybe because I had heard it was a film that tried to do something different, or maybe because I’ve always liked Allen Ginsberg’s poetry or maybe even because in the last few months I have started to think James Franco is one of the most interesting new actors around. On paper this sounded like the dream film for me. However, leaving the theatre I couldn’t help feeling a sense of disappointment for the failed attempt that it is. In the end “Howl” is just a bit of a mess… I can now see why it took so long to be released here in the UK (they’re probably hoping to cash in on the back of James Franco’s notoriety with 127 Hours). The film is essentially a biopic, not of a person, but of a poem (That by itself is a pretty new concept). How did the poem came about, when it was written and the controversy it caused… And obviously the poem itself. The directors Rob Epstein and Jeffrey Friedman, are mostly known for their documentaries The Times of Harvey Milk and The Celluloid Closet. In fact this film too was originally intended as a straight documentary. The decision for the change was due to fact that apparently there is very little material of Ginsberg himself as a young person, during the time Howl was conceived. This a certainly not a very conventional film: apparently every word and every scene has been drawn from existing material, whether from interviews, accounts, articles, court transcripts and so on. It follows several different strands and jump through several timelines. A real collage of different stories each with their own different style, pace and music and all put together sometimes in a seemingly random fashion: almost like a film within a film… within a film. There are several different sides to the film. There’s Ginsberg himself, beautifully and carismatically played by James Franco, as he’s being interviewed by a faceless reporter. This section has a sort of late 60s look in its greenish-tinted color However as he talks about his life, there are flashbacks to his life, all filmed in black and white. These are the ones who feel more superficial, even though are potentially the most interesting one and certainly the most cinematic ones. Unfortunately they’re too sporadic, too brief and the constant interruption and voice over somehow alienates its audience and makes it really hard to emotionally engage with any of it. In the end, I can’t help feeling that this part only really scratches the surface. The other layer in the film is the obscenity trial which in 1957 tried to ban the publication of the poem and prosecuted its publisher. This is the most straightforward part of “Howl”, filmed like a court room drama and focusing on the arguments between the prosecutor (played by David Strathairn) and the defense lawyer (Jon Hamm), though the testimonies of a series of mainly pompous and prejudiced witnesses from Jeff Daniels to Mary Louise-Parker. It is in a way the most engaging and interesting part of the film too also it shows you how far away that 1957 now is. Finally, there’s the poem itself: some of which is performed by James Franco in a club to a group of people in complete awe, but most of it is depicted with semi-abstract animated pieces peppered throughout the movie. This is the more “showy” part of the film and the most “arty” too (in the worse sense of the word) in my view. There’s a line at some point in the film, during the trial where somebody says “Sir, you can’t explain poetry, this is why it’s poetry”. Well, the film-makers should have probably listen to their own script a little bit more carefully and follow the advice. The moment the poem is visualized the film fails as it limits it, shrinks it and trivializes it. In the end the James Franco is the saving grace of the “Howl”. The blend of styles and the several strands of story are just too ambitious. The film feels over-crammed with things and I can’t help thinking it would have worked a lot better if the film-makers had chosen a simpler way to tell the story, without succumbing to arty devices. Hi! I just found your blog because I finally watched Howl as well and I have to say I disagree with you. I think the “interview” part makes us reflect on how the poems which are in the book were conceived and what they meant. At the same time, in the trial, we see yet again how hypocritical society really is, especially when some people believe they have so much more wisdom or “good sense” than others that they can censor them or forbid them to speak their minds, calling them filthy, degrading, or whatever. I did think the “cartoom” part was a little over-the-top at times, but I think their intention in doing it was to represent Ginsberg’s poems as hallucinating as they were meant to be. For me, a beat generation admirer, all segments of the movie worked well combined. I agree about everything you say , but I still think it as all a bit too “arty-farty” (a term which I hate, but somehow it works for this film). It’s not a bad film, but if it had been a little bit more focused it could have been a lot better. The animation just didn’t do it for me. Well, I agree. In fact, I hoped they’d focus a little bit more on his life in general, rather than, as you pointed out, the poem itself. Still, I enjoyed it. I really wanted to like this movie. James Franco, Jon Hamm etc…, but I thought it was this close to garbage. It was too pretentious and art-sy for it’s own good and it just left me to tune out of whatever message it was trying to get across. I honestly expected better.